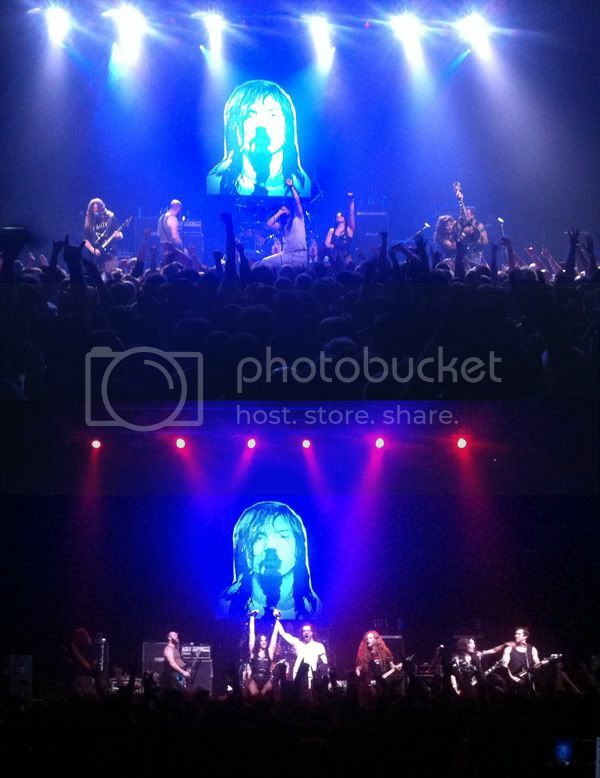 Last night, Todd and I went to see Andrew WK at the Riviera Theater in Chicago. We went with my brother and his girlfriend. I had never seen Andrew WK perform live before, and I've been listening to his albums ever since Todd and I began dating (Todd's been a fan for a long time). His music is so upbeat and fun, I was excited to see what the show had to offer. I was not disappointed! I was really excited to have a good view of the stage and to be relatively close without having to be on the main floor (we were standing behind the rail of the very first terrace/balcony, overlooking the small front floor section). It isn't often that I get such a clear and perfect view for a show, let alone one that I was so excited for! 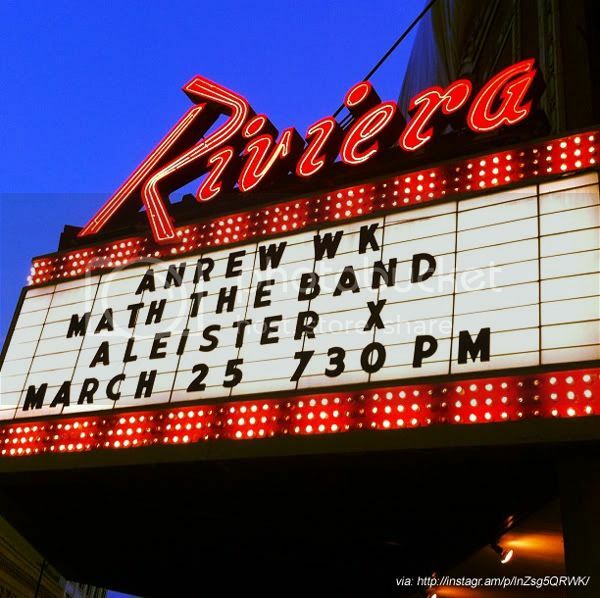 At first, I didn't think the theater was too crowded (we arrived after the first opening band, Aleister X, but just as the second one, Math the Band, was taking the stage), but by the time Andrew WK and his band was onstage, the theater was packed! This tour is celebrating the 10 year anniversary of the debut album, "I Get Wet," so the album was performed in it's entirety! It was cool to go into a show knowing exactly what was going to be played ahead of time, but there were plenty of unexpected moments as well. Between songs, Andrew WK would play random short melodies on the keyboard, make weird sounds, and talk to the audience. Several times, people from the crowd jumped up onto the stage, sang and danced for a portion of the song, and launched themselves back into the crowd - literally. At the end of the album set, the band returned to the stage to perform several songs off of "The Wolf" and finished the show with a brand new song. Andrew WK is accompanied by his wife, Cherie Lily, who we learned is from the Chicago area. It was fun to see them interact on stage together, and made me think of how cool it would be for Todd and I to quit our jobs and to travel and work together like they do. Jealous! 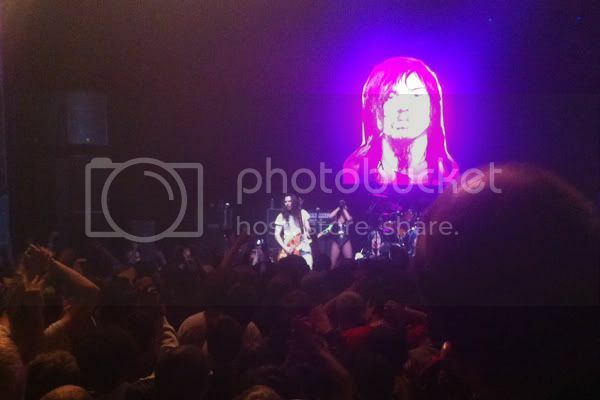 I thought it was funny that there were SEVEN people overall across the front of the stage: Andrew WK, Cherie Lily, one bass player, and FOUR guitar players. Am I alone in thinking that seems like a lot? Like it was kind of a Spinal Tap moment. Oh, and the drum set had three bass drums, all with the "I Get Wet" cover art on the heads. Again, seemed extreme for the music, but oh well. It was funny. In the above picture, you can see Andrew WK playing his "pizza" guitar. Yep, the body is shaped like a slice of pizza. Somehow I wasn't surprised when it came out. Seemed fitting. Todd bought the official "tour" shirt with the dates and such. 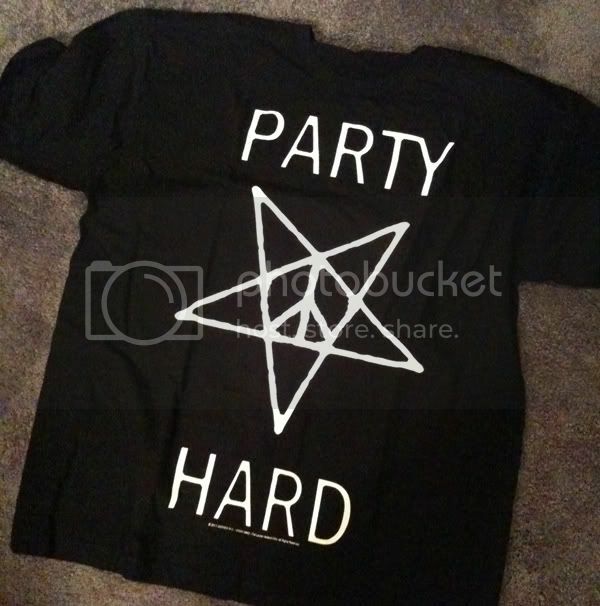 My brother and his girlfriend bought matching black shirts with "Party Hard Party Hard" written all over the front in rainbow letters. 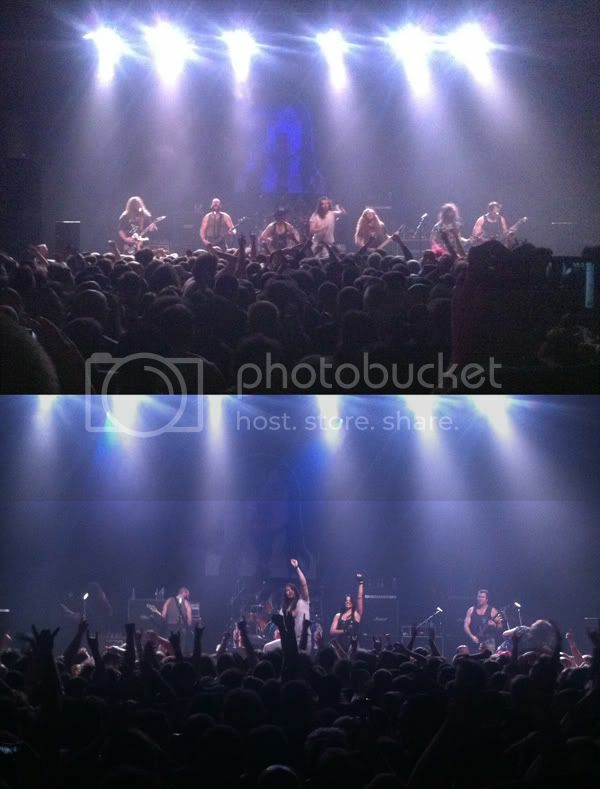 The best part about an Andrew WK show is that it reminds you to just have fun and not take life too seriously. Or, in the words of Andrew WK, you've gotta "do all the stuff that you love." I wish we could remember this more often! Thanks for the detailed post! I'm going tomorrow in NYC. What time did AWK take the stage? Argh, sorry it took me so long to get back to you. Andrew WK took the stage around 9 pm. Hope your show was awesome! Heard there's a rad after party, too. Have you ever been to Santos Party Haus? I think Josh and Erin were at this show too! A Most Metal Birth Announcement.